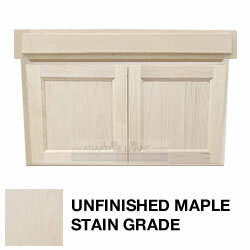 Wall Mount ADA Compliant Wheelchair Vanity Cabinet, Unfinished Stain Grade, choose Flat Panel or Raised Panel Door style. where you want to match an existing finish. Additional Freight Services Available to You: Notification Prior to Delivery; Residential Delivery; Lift Gate Service at Destination. Call for fees that may apply for these service(s).